Topic: Make a sea creature that evolved into a landcreature which has a life support system that still needs water or a winnged creature that now lives on the land. Last edited by davi; October 15th, 2004 at 04:22 PM. Was fun! Never painted so fast, prolly why it has such fucked up anatomy. "sea creature that evolved into a landcreature which has a life support system"
Schlo-mo's aquatic nature is probably the weakest. I see a few very minor webbings, but they're sort of hidden, and beyond that I don't see much of the aquatic history. Perhaps some bubbles showing that there was water in the helmet, as opposed to him wearing an air suit in the water might have helped. Fox has a really great sea creature, with tenticles and the classic Fox eyes/face. I'm diggin' a lot of this. 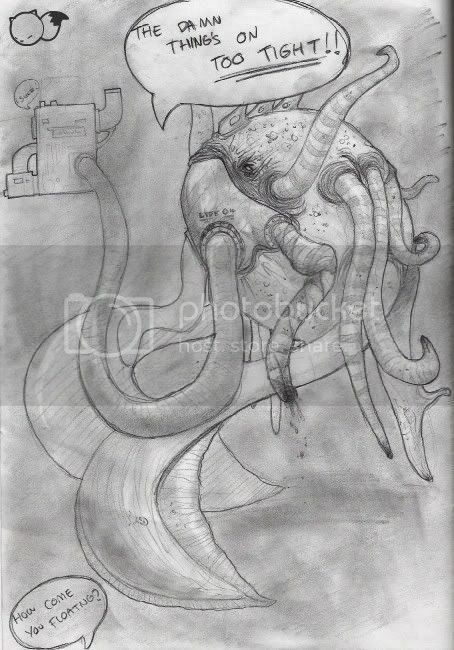 It's a pretty good drawing as far as volumes and design, although I feel that the environment lacks a bit and I don't think it'd work as a land dwelling creature. I think Rook has the strongest design, but I definately would have liked to see it on the land actually crawling around on those stubby little feet. Given the brief, I'm unsure why he's in a tank with a mask on...has he developed to a full air breathing creature but now needs to keep his skin wet? If so, maybe he's just relaxing and that mask is an air pump...not really sure. Anyways, based on design, sticking to the challenge, and overall rendering, I'm gonna have to go with Rook on this one. Good job folks! umm i think the acctual brief was a sea creature on land that needs some kind of breathing apparatus (or somthin about like that), the legs where pure chance, i didnt realise it was meant to evolve into a land dwelling creature. I thought just a sea monster on land that needed breathing help maybe im wrong tho. Ask beatnik he came up with the original thing.